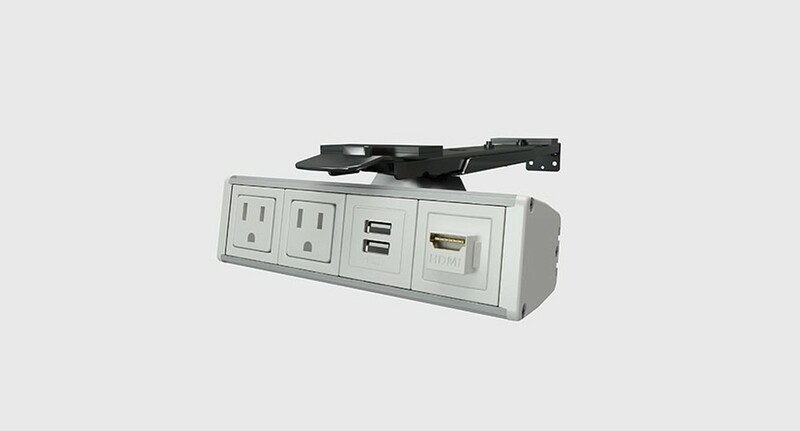 The Byrne Electrical Assemble Reveal is an under table mount AV box. It can be installed flush under to the edge of the table or 13" back to hide and slide forward, this allows it to be fully concealed under the table. When you need your connections slide it forward on the ball bearing track, this is ideal if you want it to be hidden all the time. Under table mounts are perfect for those that don't want to cut holes in their table top or just need temporary installations, this is ideal for rental applications as well. 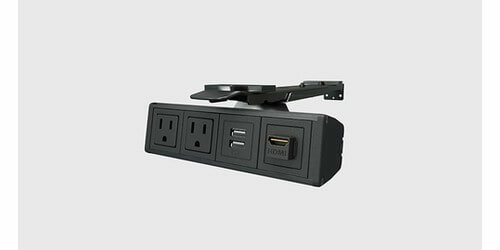 This unit comes with the following connections, 2 power with one 10' power cord, 2 charging USB (rated at 2A so can charge 2 tablets simultaneously), and one 18" F-F HDMI. The charging USB ports are integrated into the power in the box so no separate power cable needs to be plugged in. The unit comes standard in silver but can be upgraded to black. To install cut simply screw to the underside of your table. The connections are customizable and 4 more ports can be added. The power outlets can even be upgraded to hospital grade UL listed outlets. To request a quote for a different configuration or more connections please call us at 888-999-3759, click here to email us, or via Live Chat.